This wonderful photo of Bill Axcell at work in his shop was sent in by Ron Charlton. It possibly was taken in the early 1960s when Bill came to Brighton. This is what his daughter Pearl Axcell wrote in response to another photo of her father which is here. ‘He was born in Leigh-on-sea Essex and moved to Brighton in the mid 50’. His original shop was down by the Aquarium and when I was born in 1956 he put an announcement in his shop window. He moved to 28 Queens Road in the early 60s and remained there until his death in 1991 aged 63. He always maintained that he never did a days work in his life as his job was his hobby and life long love. Through the years the he developed different interests which he ran alongside the Glass animals and one of these was as Geobright. He sold rocks and minerals as well as jewellery. This is just as I remember Bill, in his shop window in Queens Road. I spent many hours watching him, both fascinated and hugely impressed. I bought from Bill, the first birthday present for my Mother, that I am ever aware that she had, she was 57 at the time. I was an apprentice, who had 4 shillings 7 pence a week spending money. Thank you Bill, my Mother loved those little animals. Terrific additional colour photo to mine! Does anybody have an external shot of the premises in Queens Road? How and where did the great man learn his skills in the first place? I’ve been to Leigh; its up the C2C rail road from me. A lovely place, and an artists’ enclave. So young in this picture Just as I remember Bill the glass man at the bottom of the Aquarium steps where he had his little booth. That was 54 years ago when I worked at the hotdog kiosk under the pier steps he was always busy but you always got a smile. Just one thing that puzzles me, Jennifer. I thought that my black and white picture was taken in the Lanes. You say however, that Mr Axcell was in Queen’s Road for his whole working life from the early 60s. Am I completely wrong on this point? Editor’s note: If you read the comment left by Pearl Axcell, Bob’s daughter, you will see that she confirms that he was indeed in Queen’s Road from the early 1960s until he retired. Dear Ed–I did read her comments, that’s my point–who was the guy I photographed in the Lanes, then? Thanks. Hi Stefan, I thought my picture was taken on one of the piers. I had this confirmed a few days ago, when a friend saw the picture and said that this was definitely on the Palace Pier. He also confirmed that this was in the same period as Bill was in the Queens Road shop. Thanks Ron, that clarifies things a bit, but I can’t help thinking my picture was taken in the Lanes in the late 1980s and not Queens Road. I saw no shop there when I went down to Brighton that day. Anyway, so there is still something of query over the matter – unless somebody….etc, etc. Cheers Stefan. I so remember this man. We would press our faces up against his window, much too rapt in him to move on with our shopping trips! My dad would allow us to stand and watch him for ages. He was always giving us a smile like he always recongnised us. Happy memories! I, too, enjoyed watching this man work. I bought a small item from him, in Queens Road, about thirty years ago. I still have it. I think, if I remember correctly, this shop was up Queen’s Road, Brighton leading to the station when I was a young girl in the sixties. Loved to watch him work. What a lovely photo and, as with other comments, this is exactly how I remember him. I also remember him from being on the pier. My mother loved his animals and I bought so many from him as presents for her. Thanks for bringing back such lovely memories of happy childhood days. I have just clicked onto this side and have been reading all the emails about Bill Axcell. I worked for him in the sixties, I loved working there. Bill showed me how to make glass earings and sometimes he would let me sit in the window at 28 Queens Road making earings when holiday makers would come to Brighton for the day. I can remember that a fire had broken out in the basement of his shop. I also went to London to sell glass animals where Bill worked at the Ideal home exhibition. Reading the emails has bought back some memories. Hey, that’s my uncle you are all chatting about! I still live in the Leigh-on-sea area. I have an old video of him on a programme from the BBC and he also ‘beat the panel’ on “What’s My Line”. I never knew his name he was just the glass animal man. Every trip to Brighton meant a stop to watch him working in the window. He made a glass seahorse for me as a birthday present (paid for by my uncle) and he told me it was the first one he had ever made. It must have been around 1965 – I still have it. I still have some glass earings he made – very treasured possessions. Loving these comments but question whether we can call him a glass blower. He used his little burner to form and shape the delicate figures so creatively. Surely he would have another title? Keep adding please, all of you. I have just found this page thanks to Sandra. Bill, as I now know him, created a small Scottie dog for me – my parents took me to his shop in the Aquarium to dull the disappointment of not being able to go on a boat trip. This was due to bad weather – I think it could have been to see HMS Brighton – it was definately a naval ship on a visit to the area. I’d forgotten all about him. This site has reawakened so many fantastic memories. I used to stand and watch his skills. I also remember the Dolls’ Hospital beneath the station, and the Barbers in the same vicinity. All part of my childhood Queen’s Road journey. If memory serves there was a Glass Animal Person at the bottom of the Aquarium Steps. As a child in the sixties I used to save my pocket money to buy a glass animal for my collection. I too, remember standing outside and watching ‘the glass animal man’ working with the flame in the shop window. I remember when as children we would catch the no 26 trolley bus down to the beach, run across the road down the aquarium steps and watch the glass blower before continuing onto the beach. Some times there used to be two guys working there. One in each window. Looking in the window was an absolute must on the way to the station, or on a Saturday shopping trip. I still have three pairs of his glass earrings – Black poodles, Bluebells (which I asked him to make especially), and Lilly of the Valley…these are all from the late 1980s. I remember in 1976/77 he made a lot of little bird earrings like swallows, which were very popular. What a delightful memory. I worked for Saunders Glass for thirtytwo years. In that time I visited Mr Axell’s Shops both at the Aquarium and also Queens Road, to repair his broken windows from time to time. The last window he had broke I asked him if he would make me an animal from the broken glass and he agreed, so I cut some up for him and he made me a dragon. My daughter’s friend worked there and he made, as a present for my daughter on behalf of her friend, two glass black cats depicting our real cats Pickle and Sooty. Still treasured in my cabinet today. I watched him in the 50s by the Aquarium and took my son to watch him in the 70s on Queens Road. I still have six pairs of his earings one of which he made especially for me, Alsation dogs. He told me to come back in an hour and they were done. Brings back fond memories of Saturday shopping trips to Brighton from Lancing in the 70s. First stop off the train was always a peek at the man making glass items, our faces stuck to the glass shop front. I saw The Glass Man of Brighton in an educational program called “Watch” during the 70s at school as a kid and was enthralled and really wanted to see the shop. I traveled down to Brighton as a teenager with a friend. Remembering this film, I found the shop and bought a little set of Siamese cats and was just as fascinated as I was years earlier. Thanks to all those of you who actually still have some of the amazing things made by the Glass Man. I bought one of his Snow Drops for an aunt of mine. Would any of you like to take a photo of your tresured item so we all can enjoy them again after so many years? Nostalgia is a wonderful thing, can be both happy and sad at the same time. I well remember watching this lovely man making the glass animals and would stand until I was dragged away. I seem to remember as a small child that he was on the Palace Pier? Then I remember the shop in Queens Road. I was always fascinated by his yellow tinted glasses and he always managed a smile. I used to wish I could buy everything! Hi. This is just a little idea. In Brighton there are buses that have well known people named on them, I wondered if anyone thought it a good idea to have The Glass Animal Man on one? I am a bit biased as he was my Dad but putting this aside all old Brightonians and other visitors to Brighton seem to remember him fondly. Any thoughts? Best wishes, Pearl Carter nee Axcell. Yes, great idea! No-one deserves it more; he was a lovely man and so kind and helpful. Nothing was too much trouble and he never minded all us kids watching him either. Ah how amazing, I was only walking down Queens Road today with my husband and we both spoke of The Glass Man, such fond memories I have. He made me many gifts for my lovely mum. I would spend many a Saturday morning watching – him such wonderful memories. I remember both the Aquarium and Queens Road shops; in fact I bought some ¼” diameter clear glass rods for a project from Mr Axcell in the mid 70s, he was a such helpful man. Like some other posters, I do remember the glass animal man on the Palace Pier in the 60s, I’m not sure if the man on the pier was Mr Axcell but the items he made were very similar. Does anybody remember the man on the pier who cut out silhouettes of people and mounted them on a bordered card? 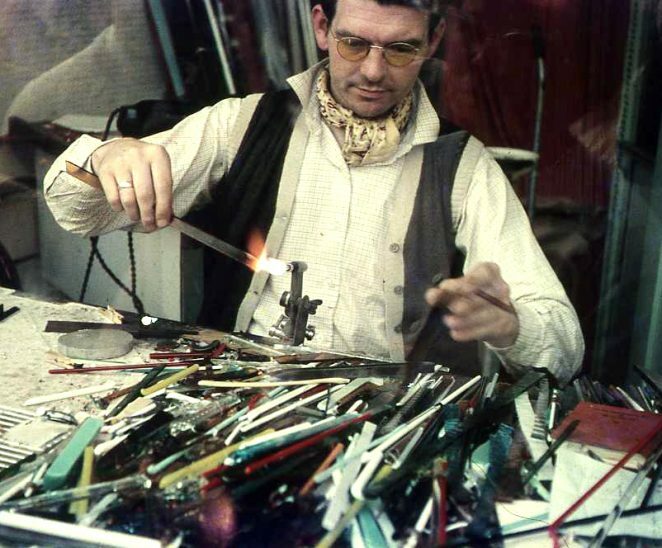 Visiting a glass blowing workshop this week reminded me of ‘the glass animal man’ in Brighton, where I lived for several years from 1969 onwards. I can still visualise his shop window in Queens Road and remember buying items as presents for my family. I just had to check him out and am so glad there is a page about him on this website! A lovely man. What fond memories, reading about ‘The Glass Animal Man’, I spent many a happy hour or two during school holidays in the sixties watching him, very often with his daughter Carol, whom I went to school with. I remember he used to blow tiny nymph-like creatures, which when placed in a bottle of water, would magically rise and fall – does anybody remember these? I worked in the shop in Queen’s Road from 1977-1991. I enjoyed my job there, putting wires on the earrings, engraving etc. It was unique. I remember I used to buy earrings from The Glass Animal Man in the late 70s/early 80s. I am pretty sure I still have a few pairs – my favourite were some red octopuses (I think that’s the plural!). I loved this shop. Brings back fond memories. I also loved his earrings – I still have a treasured pair of snowdrops. Sadly, long gone, daffodils, blue birds and pair made with shells. He was so creative as well as skilled. I still have two sets of snowdrops! I remember watching him for ages and he’d always look up and smile no matter how busy he was. Isn’t it amazing that so many of his pieces are still treasured? I live in Australia but no doubt there are little Glass Animal Man pieces in cabinets all over the world. I have already commented on this page two years ago and have just read all the other comments. I think it would be a fabulous idea to have his name on a bus – why not? He was a magical figure in Brighton loved and revered by everyone, especially young children who were enthralled watching him work. Can it be arranged? Am I the only person who remembers a ‘Glass Animal Man’ in a shop by the Arcade in Dyke Road? Used to get the 38 bus to the Arcade…this was in the 1940s/1950s and always was mesmerised by the glass animals being made. I remember one on the pier and in the Aquarium…are they all the same person? Yes my twin sister, my Mum and I remember Bill working away in his shop. We used to go and see him regularly, especially when shopping. He was adept in using the tools to stretch and curve the liquid glass, to form beautiful animals etc. Yes, we saw him in the aquarium area, then in Queens Road. I also believe I saw him on the pier. Such a nice man. I have always missed seeing him there. I remember making my Mum stop by Bill’s shop on Queens Road on the way down from the station to go shopping. Fascinating! As children, my sister and I had several of Bill’s glass animals. Sadly they have been lost over the years. Is there another ‘Glass Animal Man’ out there anywhere? Long time since I looked at Bill’s picture. Very gratifying to read all the new comments. I’ve just printed a copy of this picture and just in curiosity, I dialed up his page. Shock horror! I sent in the original, back to front (note his Waistcoat buttons). If anyone wants to see it right way round, I’ll send in another copy. Carry on browsing, Ron. Bill was a real Brighton character. You can name a Brighton & Hove bus after him by voting at https://www.surveymonkey.com/s/BTG2JSP. It would be great tribute to a lovely man. See my photo on this site in ‘Where is this shop’ for another view of the glass animal man at work. I have indeed voted for his name to be on a Brighton bus! I remember Bill well watching him in the window on Queens Road. I purchased several pairs of glass animal earrings in the 60s and still have them. Hallo Brenda, what about taking a photo of a pair of those earrings and post them on here to compliment Bill’s work? I am delighted to say that Bill has been selected to have his name on a new Brighton & Hove Bus. It’s great that after all these years he is still fondly remembered by so many people. I know that his family and friends would like to say a big thank you for keeping his memory alive on this site, and thanks to all who voted for him. I am Spanish, and lived at Hove from 1980 to 1984, when I was a teenager. Never returned, although I’ll probably do this year. I was trying to find some info about what happened to Bill, when I have found this page. I’m sad to see he died on 1991, as he represents one of the images I always asociate in my mind with Brighton and those happy days. I spent long hours watching him while he did his work and even trying to do it myself. I gave my mother one of his crystal trees with little coloured birds for her birthday and she still keeps it in her living room in Pamplona. Like others, I spent hours watching him work. I asked him for a squirrel and was told ” I do not like to make them”. Instead I watched, with a sense of amazement, as he created a wonderful giraffe for me which, thirty years later, I still treasure. I remember watching him fascinated as kids on our day trips from Pease Pottage. Was at Warden Park school with his children Peter and Carol. Peter and I were in the same year and also served together at RNAS Portland. My grandparents lived in Church Street and I remember grandad taking me around the corner to go and see the glass animal man. Fond memories and nearly 40 years ago too. I remember Mum taking me on the train from Middlesex to Brighton during school holidays of the late 1960s and early 1970s. The never-ending walk for a young child from the station to the sea and return. It was always better knowing I could stop and watch “The glass animal man”. I visited Brighton again from Cumbria just recently and the glass animal shop was one of my thoughts as I looked down on the town from the i360. Happy memories from 45 years ago. Went to Brighton last week with a friend and we were remembering the glass animal Man, trying to work out which shop it was in Queen’s Road? It was number 28, Sue.